c#,algorithm,unity3d,geometry , How to calculate points of a small circle each frame made on a sphere? How to calculate points of a small circle each frame made on a sphere? This is the idea: there is sphere with radius = 1, the center is at 0,0,0. Now, this sphere works as a sort of a scanner - when you touch any point of the sphere a line is drawn to the center of the sphere (0,0,0) from the point of touching (origin point). Each frame the point expands and turns into a ring, like a ripple, moving on the surface of the sphere. It might be a bit hard to visualize at first, but it's not that much of a difficult concept, I actually got it sort of working. The only problem - it only works from a few origin points, not from all. Now, it only has one origin point and I'm aware of that, it's just that, rather than changing the origin point, I tried rotating the entire thing, which didn't work. Now, how would I go around actually defining the origin point (any point of a sphere surface) and have the ripple start from it? Edit: I apologize for lack of information - to do this I'm using Unity, coding with C#. Aside from that, I'm not sure what other information should be required. Edit 2: I made a simple sketch of the idea - I need to find not every, but a 360+ points in the red circle. The circle starts from point A and ends at the opposite side of the sphere. Each frame I need to know the location of each point in 3D space. In this sketch there is only the point B. 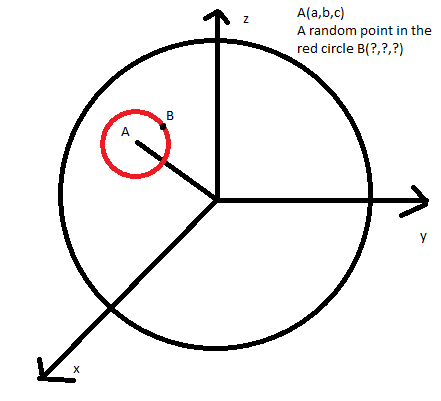 How could I calculate the position of B, knowing that the radius of the sphere and the position of point A? This formula should be applicable to any point. Edit 3: I have somewhat solved this, but in a different way without getting the equations. Because of this I do not know whether to answer my own question with a work around or leave the question for the actual answer, because this might help somebody. 1) compute distance r = |AB|, the distance between A and B.
where P is the center of the sphere, and h = (2*R^2 - r^2)/(2R) and R is the radius of the sphere. With the definition of the ripple circle, hopefully you can compute as many points on it as you want.